Speculation over the future site of President Barack Obama’s presidential library has picked up as a slew of Chicago sites—as well as some in New York, Hawaii, and even Kenya—made the June deadline for proposals. Ultimately the decision is up to the President and the board tasked with developing what will be the nation’s 14th presidential library, but dozens of groups are attempting to tug at that group’s ears. (Even I used AN‘s June editorial page to consider the library’s urban impact.) Here’s a round-up of some of the Chicago proposals made public so far. New York-based Michael Sorkin Studio released its plan for the library in January, proposing a campus stretched out along three blocks of 63rd Street in Chicago’s Woodlawn neighborhood. They’re “highly conceptual” designs, as are most floated so far, but the plan calls for a campus centered around a ring-shaped building and extending several blocks. The development would make use of dozens of vacant lots in a struggling neighborhood adjacent to the University of Chicago. There’s a concerted effort to bring Obama’s library to Bronzeville, the South Side neighborhood and “black metropolis” vying to become a national heritage area. One prominent site there is the area once home to the Michael Reese Hospital. 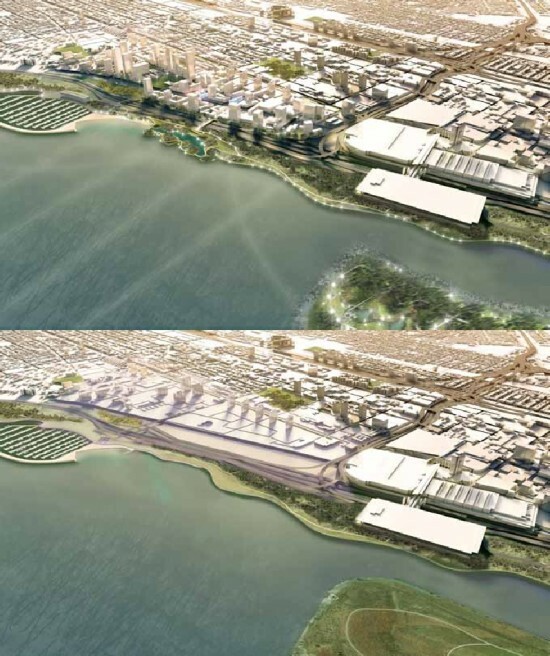 Combined with parking lots on the other side of South Lake Shore Drive, the site would total 90 acres of lakefront property. It’s been targeted for other large developments, including a casino, a data center and housing for Olympic athletes during Chicago’s failed 2016 bid. A few years ago SOM led a team of designers and developers tasked with sizing up the site for redevelopment, and you can read their plans here. 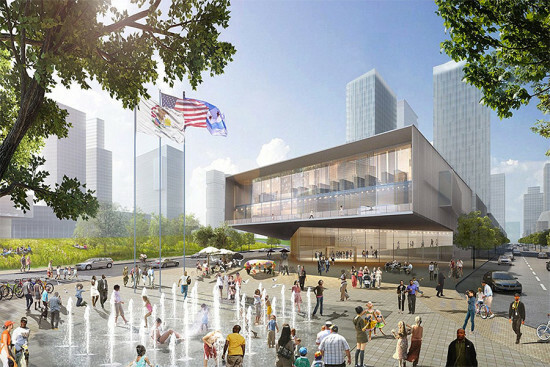 HOK recently floated a plan for redevelopment of the Michael Reese site, including a rendering (at top) of the proposed library. McCaffery Interests and U.S. Steel teamed up to rehabilitate that industrial giant’s nearly 600-acre lake infill site in the neighborhood of South Chicago. It’s the largest undeveloped site in the city. The Chicago Sun-Times’ Lynn Sweet first reported last week that McCaffery threw his hat in the ring for Obama’s library. 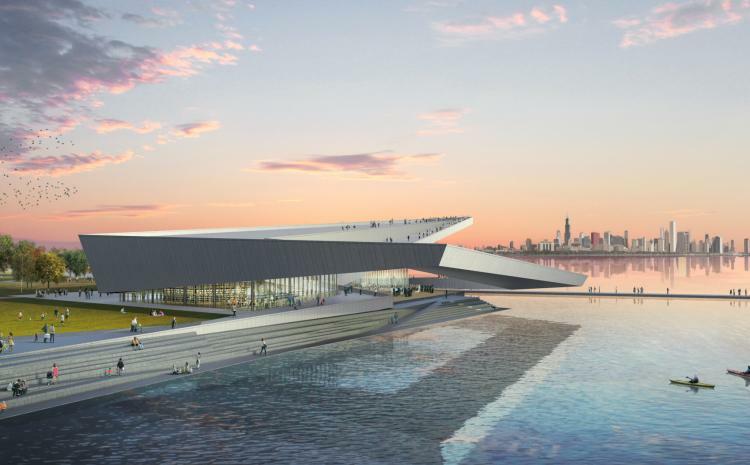 Renderings from SOM, Lakeside’s lead design firm, show a heavy walkway that twists elegantly upward around a glass box, jutting over Lake Michigan that appears here as if it were the world’s largest reflecting pool. Down the road from Lakeside, Chicago State University is also a potential site. It’s situated in Roseland, where Obama worked as a community organizer. For the Huffington Post, Hermene Hartman argued CSU is the best place for the library, because it would have the greatest neighborhood impact. The U of C called the library “an historic opportunity for our community,” and—to no one’s surprise—submitted a proposal to bring Obama’s legacy back to where he taught law. They set up a website for the bid, but no images or details are publicly available at this time. 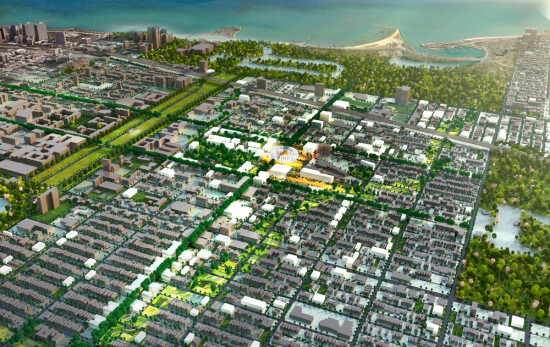 U of I is among the institutions of higher education vying for the library, and it has proposed three plans on the West Side: a 23-acre site in North Lawndale; an “academic” option at UIC-Halsted; and a “medical” option at the Illinois Medical District, which is also home to another long-vacant white elephant—the Cook County Hospital building. 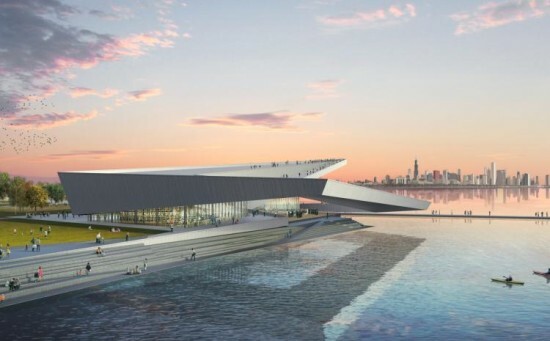 As reported by Ted Cox for DNAinfo Chicago, Ward Miller, president of Preservation Chicago, thinks the library could revitalize the underused Lakeside Center East Building at McCormick Place, the massive convention center on Chicago’s near South Side. Miller previously proposed that the building be considered for George Lucas’ Museum of Narrative Art.